Bathrooms are usually designed for functionality unless of course, you have the money and the space to have a luxurious bathing area. For some people, a simple color combination can be used to add beauty and elegance, and blue and white is a very common choice. If you are thinking of using these two colors for your bathroom design idea, you should check out these great samples. 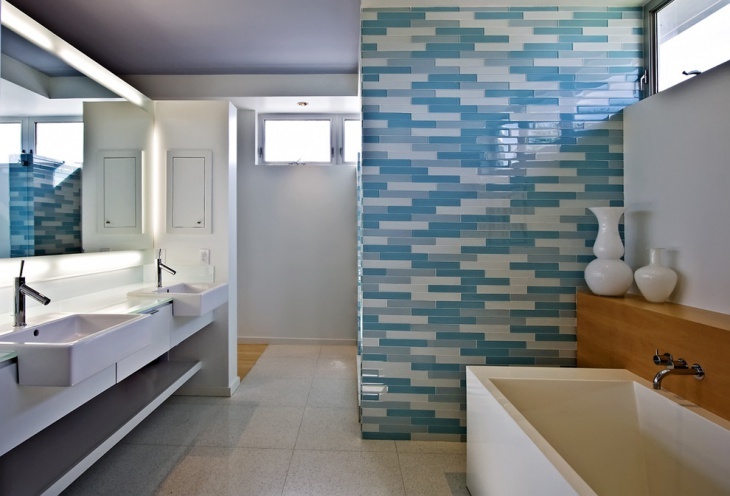 This bathroom’s blue and white splashback tiles provided the decorative aspect to an otherwise very simple design. The whole set up is more on functionality than elegance, and yet the tiles give the room some kind of unique character. 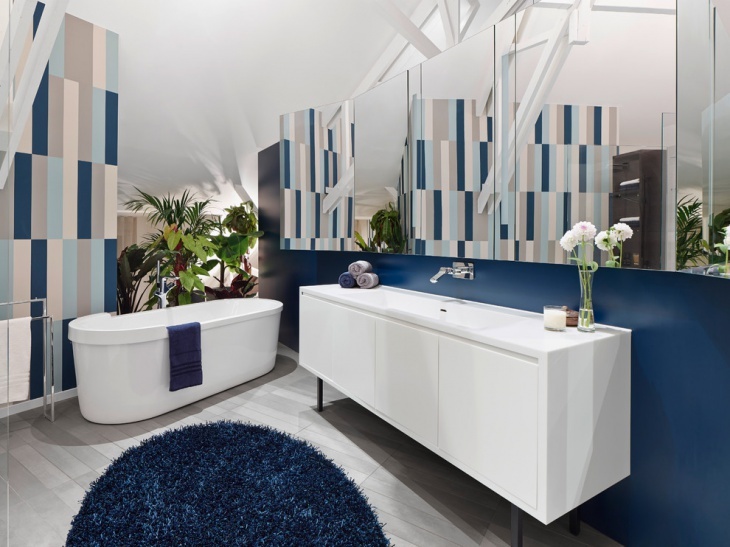 This bathroom is pure heaven to look at – dark blue walls in a sea of whiteness. 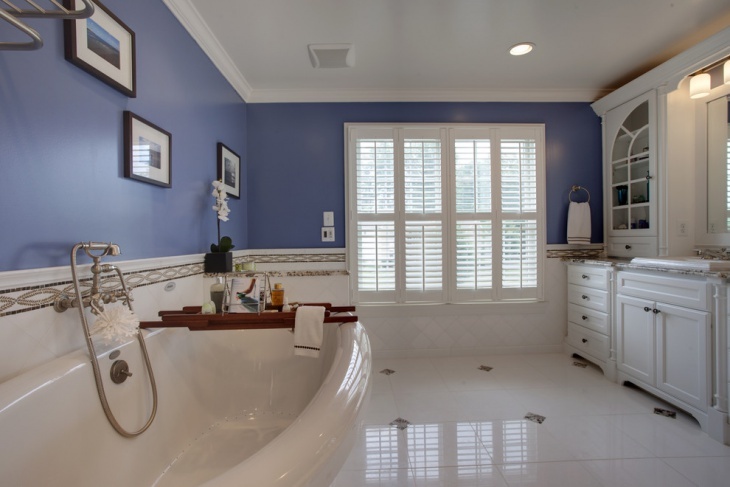 The ceiling compliments the sparkling white tile flooring and the matching white tub and cabinets. And the wooden soap tray at the end of the tub, the framed artworks and the metal shower head provide the much-needed contrast. 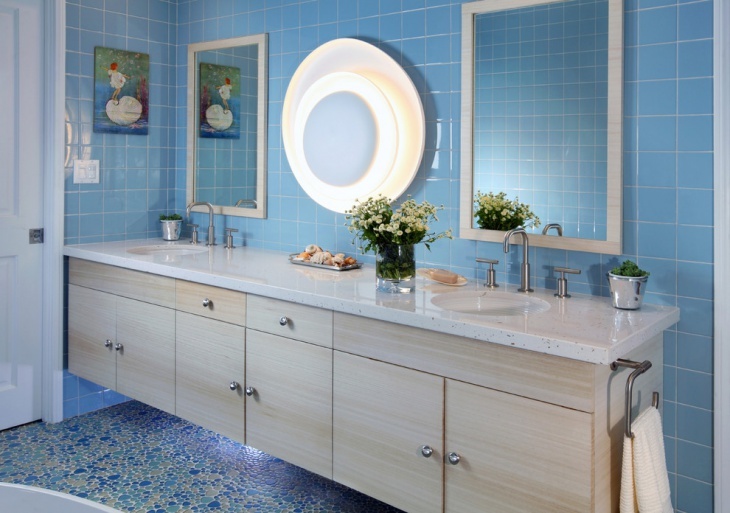 For a masculine bathroom idea, blue is always a good choice of color. This bathroom has blue walls, white doors, and white tile flooring. 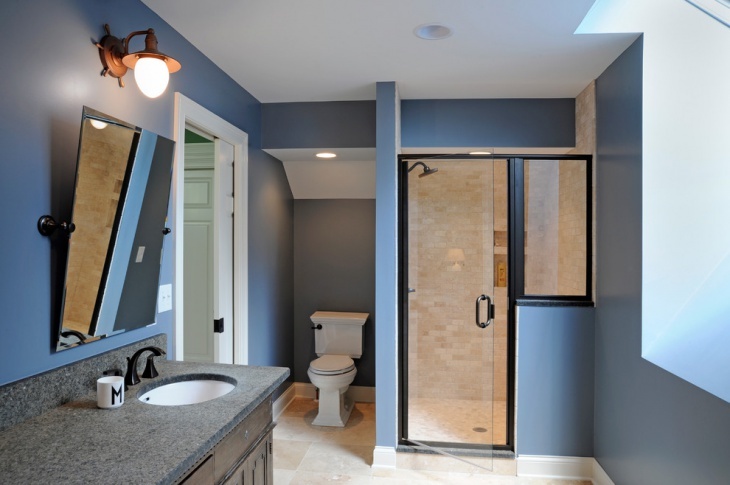 The copper pendant light holder and the black frame for the glass shower door add dashes of color. 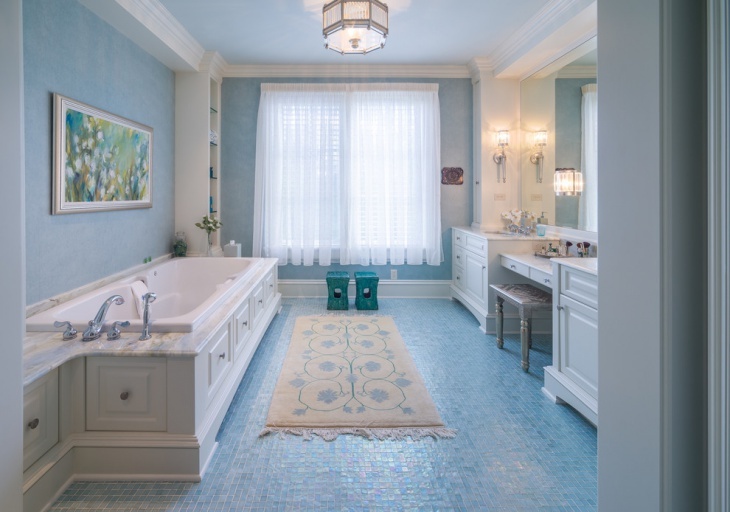 The light blue tiles used for the sink wall of this bathroom is the perfect match to the flooring done in multiple small stones in white and different shades of blue. 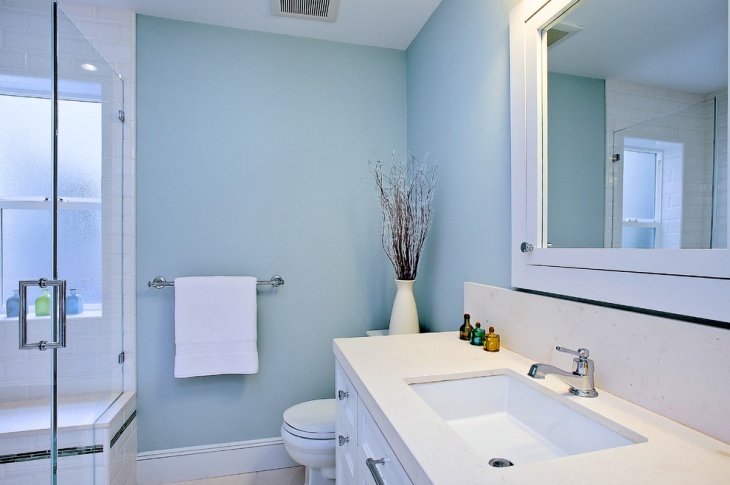 This setup allows for a very relaxing ambiance, which is enhanced by the white granite sink top, the white frame for the vanity mirrors and the white round base of the wall light. 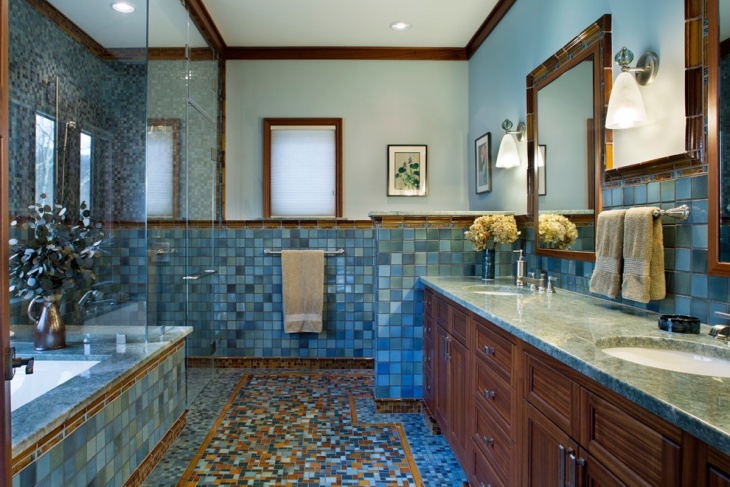 The vintage look is achieved for this bathroom through the use of blue tiles for the walls. The tiles are assembled in a random selection of different blue shades, which complements the mosaic tiles used for the flooring. 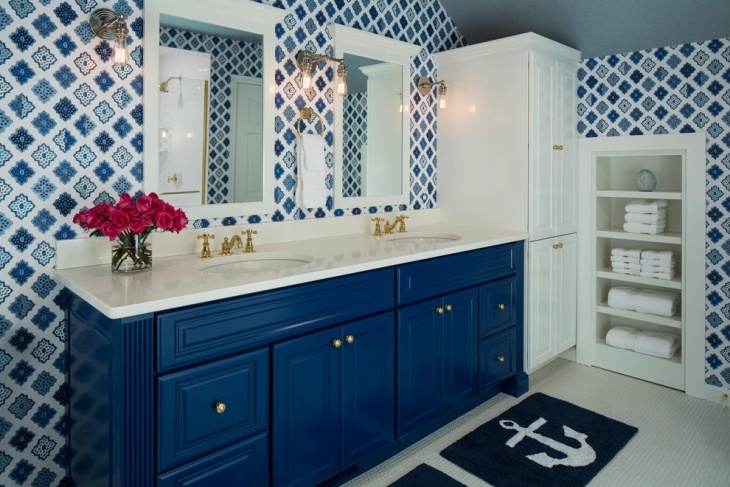 This blue and white bathroom is accessorized in blue. The light blue paint used for the upper wall is almost the same shade as the towels and the small bird cage used for decorating the white sink top and cabinets. 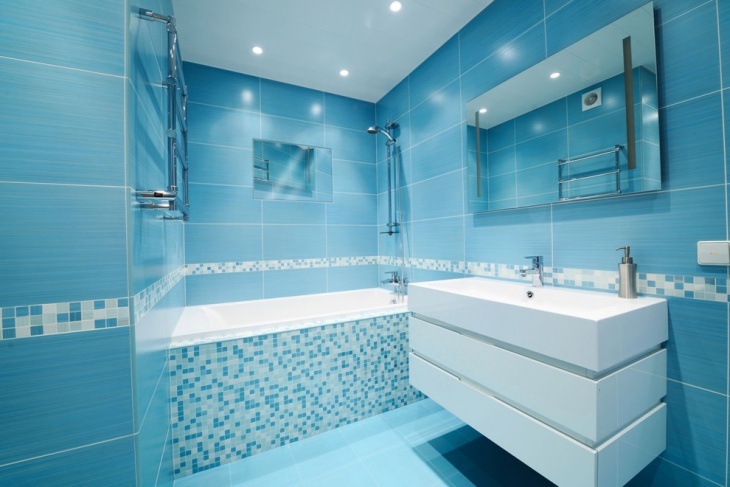 To add more blue accents, a thin line of the tub wall is decorated with blue stones in different shades and sizes. 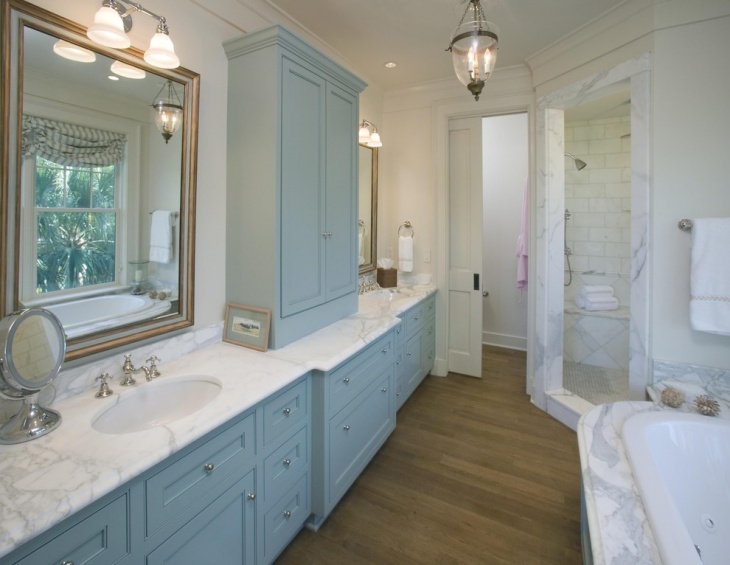 Blue, white and natural wood are the basic elements that make this bathroom look so neat and elegant. 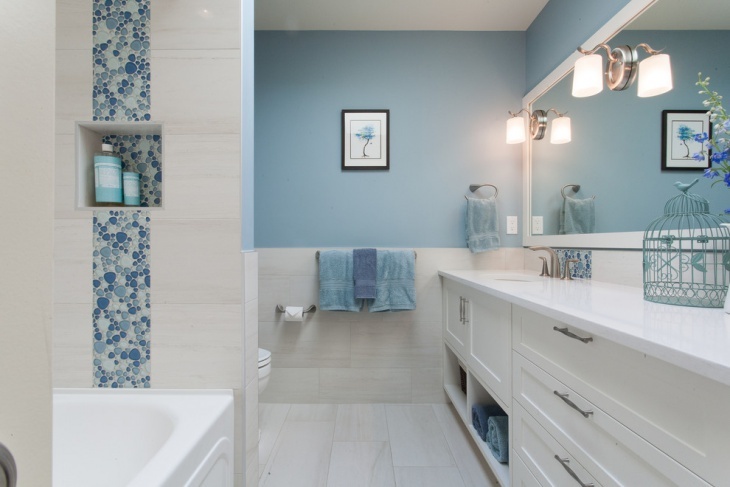 The sink cabinets and the vanity storage are painted in a very relaxing light blue hue, which balances off the whiteness of the wall, ceiling, sink top and tub frame, shower tiles and the door. 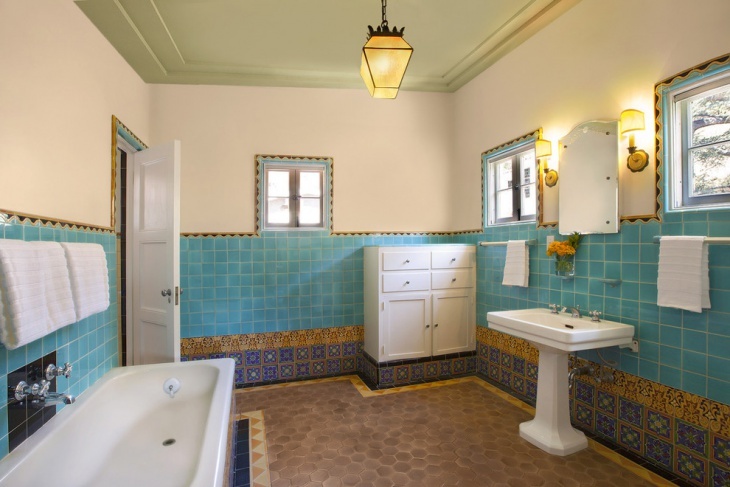 Small blue tiles are used for the flooring design of this traditional bathroom to give emphasis to the vintage look. The wall facing the vanity is painted in light blue to match the floor while the white color used for the rest of the setup completes the heavenly look. 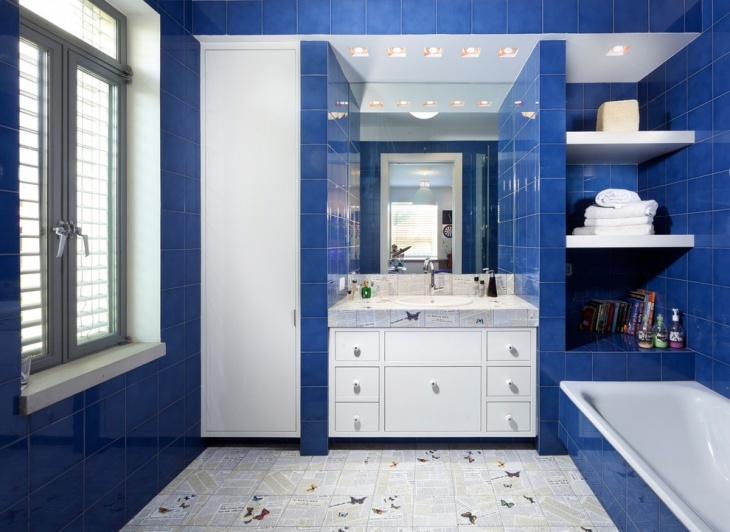 This transitional bathroom speaks modern design quite loud, and that is thanks to the brightly designed wall in blue and white backsplash tiles. The rest of the room is covered in an immaculate white cloud, making this a really nice and relaxing bathing space. 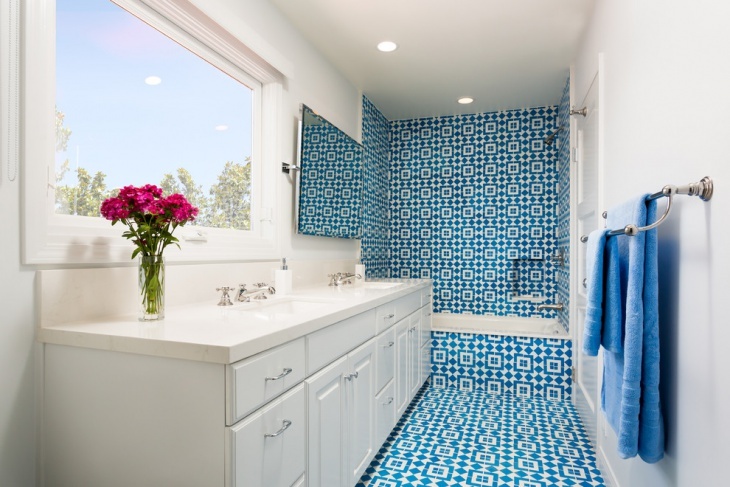 This spacious bathroom is elegantly designed with walls of floral accents and blue tiles. This combination results in a beautiful Mediterranean look, which in turn is complimented by the whiteness of the sink and the tub, as well as the light green paint used for the ceiling.